70% interest in joint venture over Kitotolo Lithium Project, being formalised. Along-strike from AVZ’s world-class Manono Project. Project area contains numerous historical artisanal workings, focussed on cassiterite and columbite-tantalum mining. Project area has not been subject to any modern exploration. Initial investigations have identified spodumene in pegmatites across significant areas within Project area which are open in all directions and are considered to potentially extend for kilometres along a NE-SW trend. Assays from rock and channel samples confirm high grade lithium mineralisation (up to 2.15% Li2O). Aggressive exploration planned, initial phase to comprise trenching, test pitting and auger drilling of fresh spodumene in pegmatite (CY2017). Mr Sullivan reported visible pegmatite and spodumene mineralisation across large sections of the Project area. Test-pitting – 11 lines at 100 metre intervals, with each line 1km long for a total of 121 test pits. Centred around the large artisanal pit in the north of the Project area where spodumene in pegmatite observed and assays confirmed high grade lithium mineralisation. Designed to cover a large area quickly and to expose bedrock geology for geochemistry sampling and gain structural information under the lateritic cover. Assist in determining the length and width of strike extensions of the identified pegmatite, which is currently open in all direction and considered to potentially extend for several kilometres along a NE-SW trend. Follow-up infill trenching to add continuous geological understanding of in situ pegmatites and for sampling mineralisation across the exposed and inferred strike of the pegmatite trend. Further regional test-pitting and trenching using wider step-outs based on the results of Phases 1 and 2, also on the NE-SW trend. This to assist in determining the regional strike length potential of the pegmatite mineralisation within the Project area. The aim of the test pits and trenching will be to assist in reaching in situ bedrock below the lateritic cover for logging and geochemistry sampling, and to provide invaluable information to assist in future exploration phases, including drilling in 2018. Commencement of Maiden Exploration Program (Phase 1). Trenching, test-pitting and auger drilling to determine length and width of pegmatite evident in large artisanal pit in north of Project area, and lithium content of fresh spodumene in the pegmatite. Exploration results from Maiden Exploration Program. Initial determination of strike length potential of the pegmatite mineralisation within the Project area. Estimation of initial Exploration Target for the Kitotolo Lithium Project. Maiden Drilling Program: to determine depth and lithium grade of pegmatites. 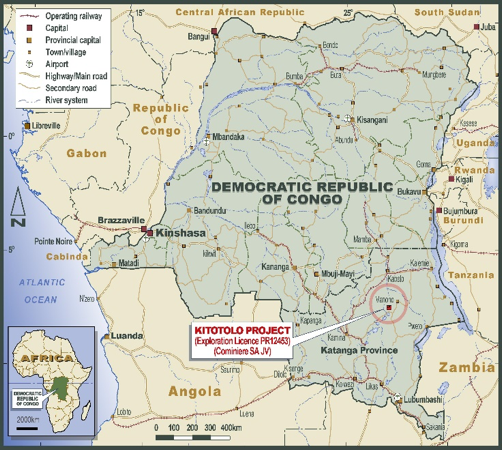 Manono lies just 40 kilometres north-east of the Kitotolo Project.AVZ’s Manono Lithium Project is potentially one of the largest lithium-rich LCT (Lithium, Caesium, Tantalum) pegmatite deposits in the world. Work performed to date by AVZ has demonstrated that the Manono pegmatites extend for a strike length of 13km+ and are more than 200m wide and more 240m thick in places. AVZ announced on 12 September 2017 that it had upgraded its exploration target to between 1Bt and 1.2Bt of between 1.25% and 1.5% Li2O. AVZ’s Manono Project contains many pegmatites. The two largest of these, Carriere de L’est and Roche Dure, are considered to be the two largest pegmatites in the world, and both larger than the famous Greenbushes Pegmatite in Western Australia. Initial samples taken from outcrops of highly weathered pegmatite contained relatively low concentrations of lithium. Subsequent trenching and more recently drilling of fresh pegmatite have returned extremely high concentrations of lithium. AVZ’s Manono Project is thought to lie in a much larger pegmatite field extending as far as Kolwezi in the south-west to Kalemie in the north-east. The project is 40 kilometres north-east of Kitotolo, the Pegmatite strike length was recorded at around 13 kilometres and the AVZ market has capitalised to the sum of $434 million. Electric Vehicles: The critical elements in lithium ion batteries, the most commonly used, include graphite, cobalt, nickel, manganese and lithium, of course. Chemicals: Lithium based chemicals such as lithium carbonate, lithium bromide, lithium chloride, and lithium hydroxide are widely used in industrial applications including refrigeration, air-conditioning, manufacture of lubricants and aluminium smelting. Glass & Ceramics: Lithium is widely used in glass and glass-ceramics including induction cooktops and cookware. Lithium ores are used in glass manufacture to lower melting/firing times and furnace temperatures and save energy, improve quality and glass strength. Medicine: Lithium is used in a range of medicines to treat psychiatric illnesses including depression, bipolar disorder and other brain disorders. Lithium consumption globally has grown significantly since 2000. Consumption grown 11% year-on-year over past 8 years. Demand set to increase rapidly with greater demand for electric vehicles. 11% year-on-year growth of global lithium consumption. >50% of lithium consumption due to demand for rechargeable battery. 250,000 metric tonnes of lithium consumed every year. Britain, France and China are aiming to phase out sales by 2040. Car manufacturers are following suit, with Volvo announcing it would only make electric or hybrid vehicles from 2019.